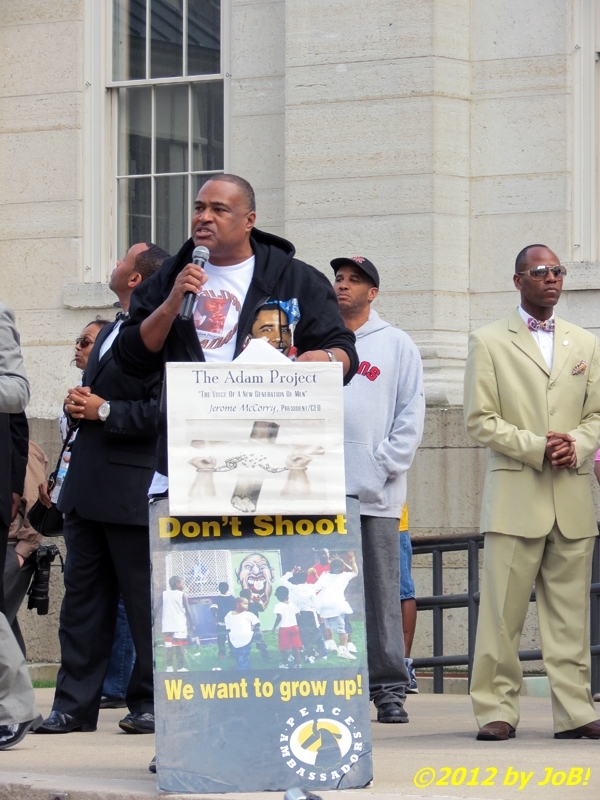 Reverend Jerome McCorry, president of the Adam Project, Inc., provides opening remarks at the Trayvon Martin 'hoodie' rally at Dayton's Courthouse Square on Sunday afternoon. McCorry opened the rally by thanking those who came out to support Martin but also said that there was 'family business' that needed to be addressed. 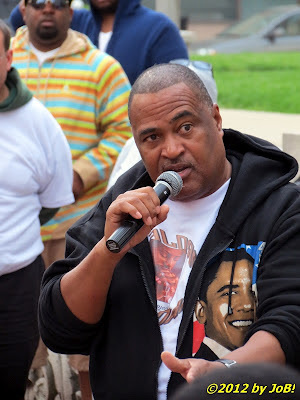 He turned the program over to master of ceremonies, local businessman and community activist Tommy Owens, Jr. who, in his remarks, made connections between the Florida tragedy to those seen in the Dayton area in recent months. 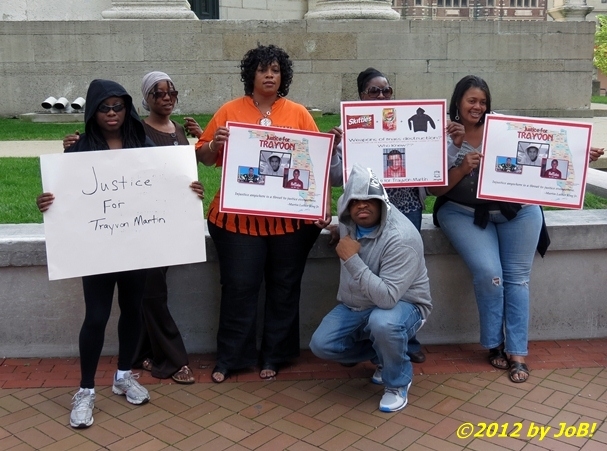 Dayton community activist Tommy Owens, Jr. (crouching, center) poses with five young women expressing their support for Trayvon Martin at the 'hoodie' rally at the city's Courthouse Square on Sunday afternoon. While the Florida incident has grasped the nation's attention, two similar episodes of perceived racial injustice were recently felt within the local African-American community with the suspicious deaths of two men at the hands of law enforcement personnel in Montgomery County. In July 2011, Kylen English, 20, in custody on burglary charges, plunged to his death off of Dayton's Salem Avenue bridge when he headbutted the rear door window of a police cruiser to eventually escape and allegedly dove head-first, while handcuffed, off of that structure. Last fall, two law firms filed a wrongful death lawsuit against the Dayton Police Department. Bobby English, father of Kylen English, is interviewed by a local internet radio host after the 'hoodie' rally at Dayton's Courthouse Square on Sunday afternoon. On March 1, just four days after the Martin shooting, Dante Price, 25, was shot dead by two uniformed security guards at his girlfriend's apartment complex for allegedly trespassing on that property. Price was shot over 20 times by the guards because they alleged he was using his car as a 'weapon' when they tried to detain him for turnover to the city police. 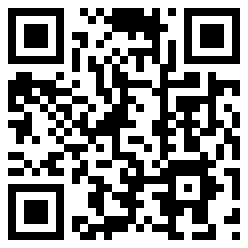 The matter is currently under investigation by authorities. 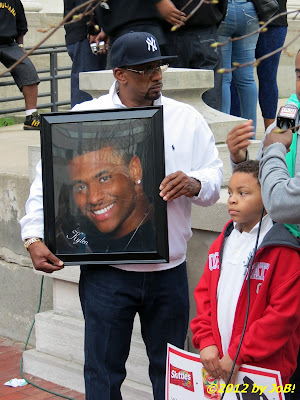 Representatives of both victim's families appeared at the rally. 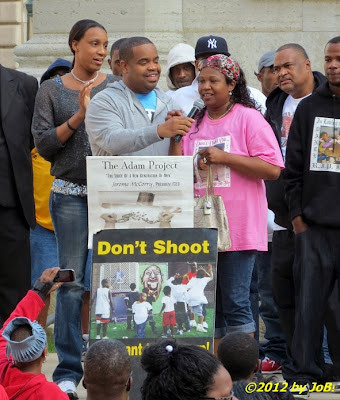 Saprena Riley (in pink shirt), mother of Dante Price, speaks to the crowd at the 'hoodie' rally in Dayton's Courthouse Square on Sunday afternoon. Marlon Shackelford, a street advocate supervisor at the Omega Community Development Corporation, was invited to speak and brought up the symbolism of hooded shirts and jackets. He said that people sometimes wear them with the hoods over their heads when they are mad and then asked the crowd to put their 'hoodies' down to calmly reflect on activities in their own neighborhoods and communities. Unfortunately, with the continued problem of "black-on-black" violence, he lamented that this will probably not be the last time that such a gathering would be needed. 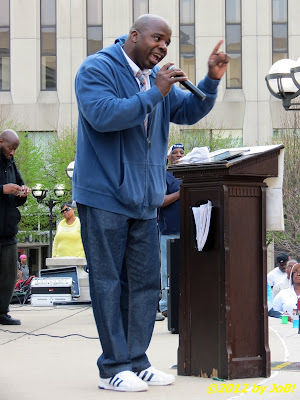 Sean Walton, director of Youth Initiatives for Community Action Partnership of the Greater Dayton Area, addresses the crowd at the 'hoodie' rally at Dayton's Courthouse Square on Sunday afternoon. The next speaker, Sean Walton, said "we should not denigrate the humanity in people by saying that it's just black folks who are upset by this" and alluded to the national and international response to this perceived injustice. He then compared the Trayvon Martin situation to one from 1994 involving the possible caning of an American young man for vandalism in Singapore. Michael P. Fay, then an 18-year old living with his mother in that Southeastern Asian city-state, was convicted of stealing traffic signs and damaging cars and was sentenced to receive six lashes as part of his punishment. Walton reminded the crowd of how President Clinton and the US Congress reacted, directly petitioning the Singapore government not to dole out corporal punishment to Fay while not including the other non-Americans who were also involved and sentenced to the same caning. He said that they were all human beings and it would be the "humane thing to treat each other right" instead of asking for special treatment due to nationality or race. 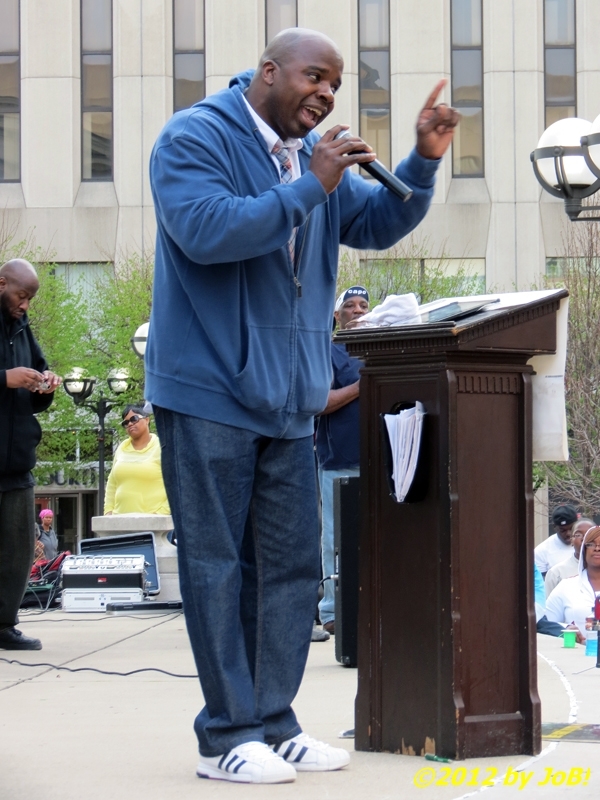 The Reverend Andre Hayes, pastor of Dayton's Sunlight Missionary Baptist Church, speaks to the crowd at the 'hoodie' rally at Courthouse Square on Sunday afternoon. In a subsequent plea for action to those gathered, Reverend Andre Hayes said that "we need to start coming out before the fact instead of after the fact." The pastor of Dayton's Sunlight Missionary Baptist Church described that afternoon's rally as an event that would not be necessary if people were already policing their own neighborhoods and households. "You don't put salt on meat after it spoils", Hayes said, and, to improve our communities, people should "start looking into the mirror instead of looking out the window." Brother Tyrone Muhammad, representing the Nation of Islam's Dayton Study Group, makes brief remarks at the Dayton 'hoodie' rally at the city's Courthouse Square on Sunday afternoon. 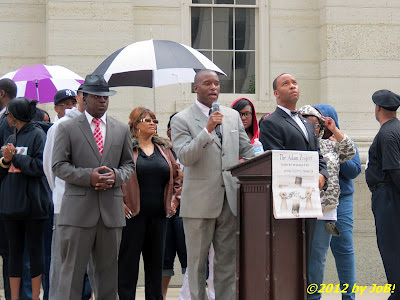 Brother Tyrone Muhammad, a representative of the Nation of Islam's Dayton Study Group, said that "95 percent of our problems can be solved by our unity." 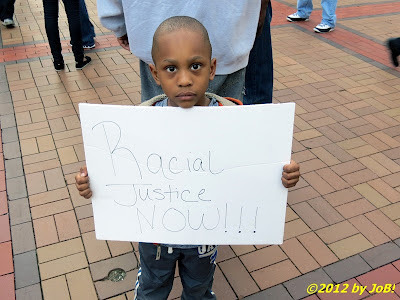 He stated that other ethnic and racial groups do not need to hold rallies because they are already united and he attributes the high number of black homicides and black-on-black crime to this lack of community cohesion. Muhammad also mentioned how the media has been "muddying" issues surrounding the Martin case, comparing it to the frenzy surrounding Philadelphia Eagles quarterback Michael Vick and dog fighting charges back in 2007. Bishop Richard Cox (grey sweatshirt in center), president of the Dayton chapter of the Southern Christian Leadership Conference, evokes a plea for a new 'black power' at Dayton's 'hoodie' rally Sunday afternoon at Courthouse Square. Bishop Richard Cox, president of the local chapter of the Southern Christian Leadership Conference, followed Muhammad and started his remarks by providing a new definition of 'black power' to the crowd. "Black power is black maturity...black maturity is economic security...economic security is political ingenuity...and all must be predicated upon books, bucks and ballots." 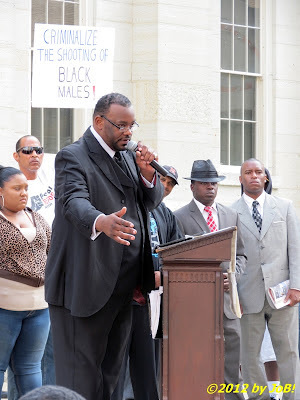 As the point person for the community's response to the Dante Price shooting, he updated the gathering on his recent discussions with US representative Mike Turner and other local representatives and announced a "Rally for Justice" on Wednesday afternoon at Dayton City Hall right before the scheduled city council meeting that same evening. Reverend Jerome McCorry, president of the Adam Project, Inc., delivering his personal remarks at the conclusion of the Trayvon Martin 'hoodie' rally at Dayton's Courthouse Square on Sunday afternoon. As the concluding speaker, Reverend McCorry said that he and all of the previous presenters had come to "make a statement." As the head of an organization focused on reducing criminal recidivism among African-American males in the local community, he sees the scourge of black-on-black crime on a daily basis and has grown "tired" of seeing "us killing each other." He shared a recent claim of hypocrisy by members of the press to his and others' outcry over the Martin, English and Price deaths while ignoring those at the hands of other African-Americans. "As a community activist who speaks out on violence. 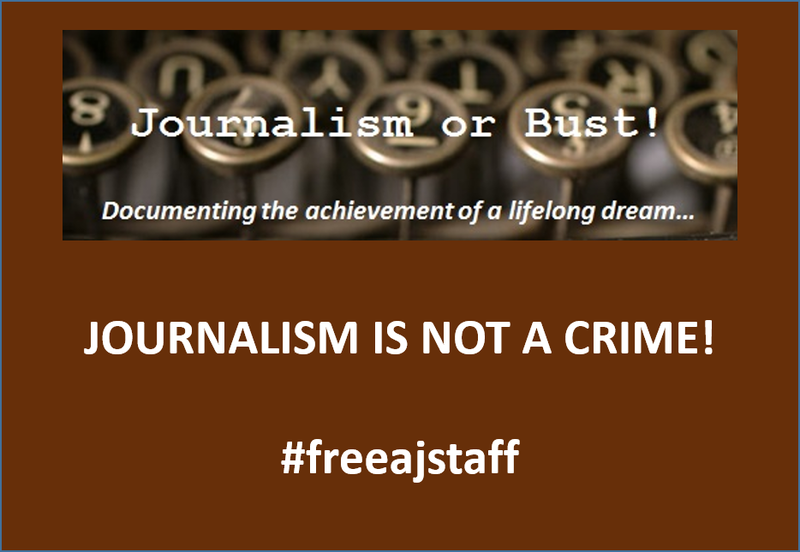 for me to speak out on violence at any level and not there with it on every level makes me irresponsible," McCorry said, who sees this line of media questioning as an unintended consequence of such visible problems within this specific segment of the community. 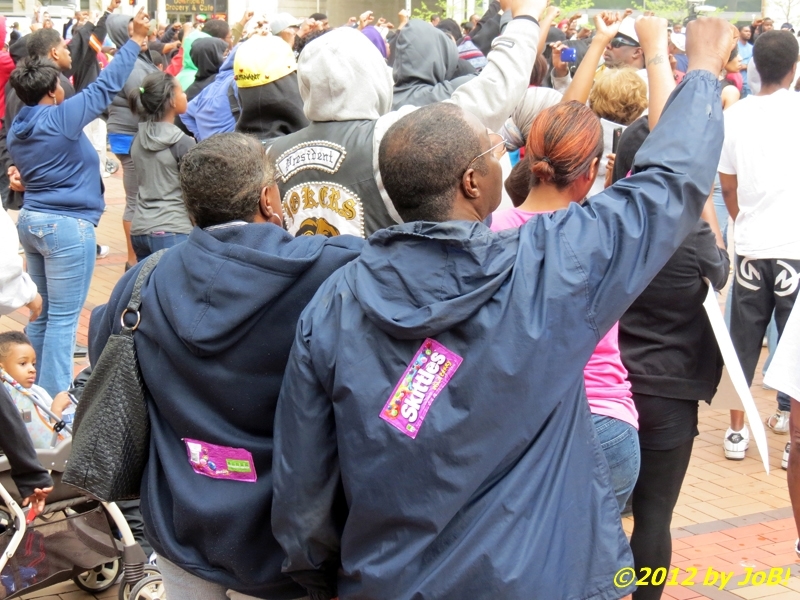 Two supporters of Trayvon Martin wearing Skittles wrappers on the back of their 'hoodies' during the rally at Dayton's Courthouse Square on Sunday afternoon. In an impassioned plea to those he called "Facebook warriors"--people who show their support online instead of in person, McCorry said that he and others need to get mad enough to do something about this and other related issues before the next tragedy strikes. He stated that other groups besides African-Americans are outraged by the Martin tragedy and others like it and that we can all stand shoulder-to-shoulder be behind something that is right. "When we stand together, we can change America," he said. Several hundred members attending the rally in support of Trayvon Martin in Dayton's Courthouse Square on Sunday afternoon (click on the photos to get full-sized versions). After the rally, McCorry expressed his delight in how the rally transpired, calling it a "major success and only the beginning." 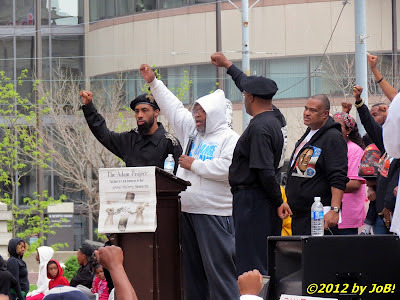 Seeing such a large number of young people in attendance gave him cause for excitement for future events, to include upcoming "Peace in the Hood" event throughout Montgomery County during 2012. "Movements are built upon young people," he continued, "and the Civil Rights Movement, the Student Nonviolent Coordinating Committee and other young people who were there with Doctor King, those who were there with Ralph Abernathy and others so we're excited to see this many young people." 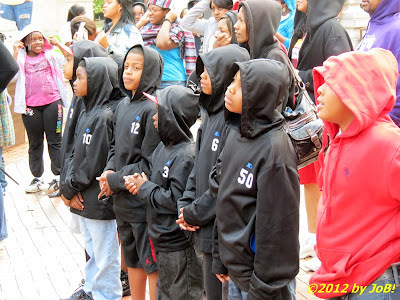 Members of the Dayton Airmen, an 8-and-under youth basketball league, don their hooded sweatshirt in support of Trayvon Martin at Dayton's 'hoodie' rally at Courthouse Square on Sunday afternoon. Two of those younger community members showing up in support for Trayvon Martin echoed those sentiments. Jordan Grandy and JaKhairi Routhier, both 16 years old and from Dayton, said that they initially came out to show their support for the perceived injustice involving the legal issues surrounding his death. These two young men, like their peers in the crowd, were the intended recipients of the rally's overall message and only time will tell if that message was received. 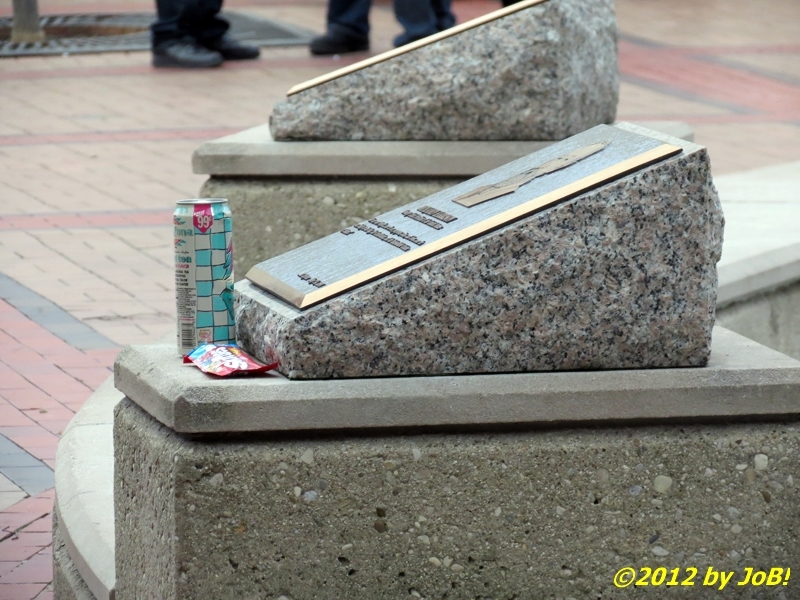 A makeshift memorial for Trayvon Martin near the fountain at Dayton's Courthouse Square after the 'hoodie' rally on Sunday afternoon. Martin was returning from a convenience store with candy and a soft drink when he was shot and killed by George Zimmerman.